French officials said on Friday they expect planned "yellow vest" demonstrations this weekend to be bigger and more violent than a week ago, as the protest movement which had shown signs of fatigue at the end of 2018 gains fresh impetus. 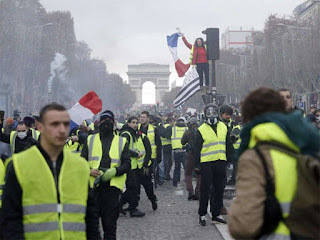 National police chief Eric Morvan told France Inter radio he expected "a return to a level of mobilisation seen before the Christmas holidays", for the ninth consecutive Saturday of nationwide protests, which have been characterised by clashes with police and destruction of property. On January 5, around 50,000 people wearing the movement's trademark high-visibility vests demonstrated in Paris and other cities, an increase over late December but far below the nearly 300,000 that turned out for the inaugural protest in mid-November. Paris police chief Michel Delpuech said he expected the demonstrators in Paris to outnumber the estimated 3,500 that attempted to march on the National Assembly last week, and predicted they would be "more tempted by violence." The head of security in the Cher region announced that the "yellow vests" would be banned from demonstrating in the historic heart of Bourges, the central town on which some had set their sights Saturday. Last week's protests were marked by a return of the clashes and destruction seen at the height of the protests in late November and early December. "Week after week we have observed a drift towards increasingly violent behaviour," Delpuech told France Inter radio, adding that symbols of state power had become the chief targets. The "yellow vests" accuse the police of fanning the flames with their liberal use of tear gas, rubber bullets and stun grenades against demonstrators. President Emmanuel Macron's government is taking an increasingly tough line with the revolt, which began in mid-November in the rural heartland over fuel taxes and quickly ballooned into a wholesale rejection of the president. "Those who question our institutions will not have the last word," Philippe said. He also announced plans for legislation to ban known "troublemakers" from taking part in demonstrations. Macron tried to take the heat out of the protests in December by announcing a 10-billion-euro ($11.5-billion) package of wage boosts and tax relief for low earners. With that falling short of the mark, the president is now pinning his hopes on a two-month "grand national debate" on voters' grievances starting Tuesday -- a response to the protesters' call for ordinary citizens to have more of a say in the running of the country. But a poll by the respected Cevipof political sciences institute released Friday showed the odds stacked against Macron. The poll found distrust of politicians at an all-time high, with 77 percent of respondents saying they inspired "distrust", "disgust" or "boredom".